It always bugs me when people say Chicago’s a great city but complain that there’s no access to natural beauty or outdoor adventure here. True, there are no mountains or saltwater for hundreds of miles, but we have ocean-like Lake Michigan close at hand, making this one of the few major United States cities where you can work in a skyscraper and easily take your lunch break on a sandy beach. And this is a great place to live if you want to commune with nature without polluting the environment to get there. The South Shore Line electric railroad takes you directly from Millennium Park to the campgrounds of the picturesque Indiana Dunes. And the bicycle-friendly Metra commuter rail system means that you can get to state parks like Illinois Beach, Fox Lake and Kettle Moraine via a relaxing train ride plus a bit of pedaling, instead of fighting traffic jams. Having a good time in the great outdoors near Chicago is really just a matter of attitude. Case in point were a couple of car-free excursions I took on Labor Day weekend by land and by sea—I mean lake. That Saturday night I bicycled up to Ravinia Festival, a lovely outdoor music venue in north suburban Highland Park, to see the legendary pop duo Hall & Oates. 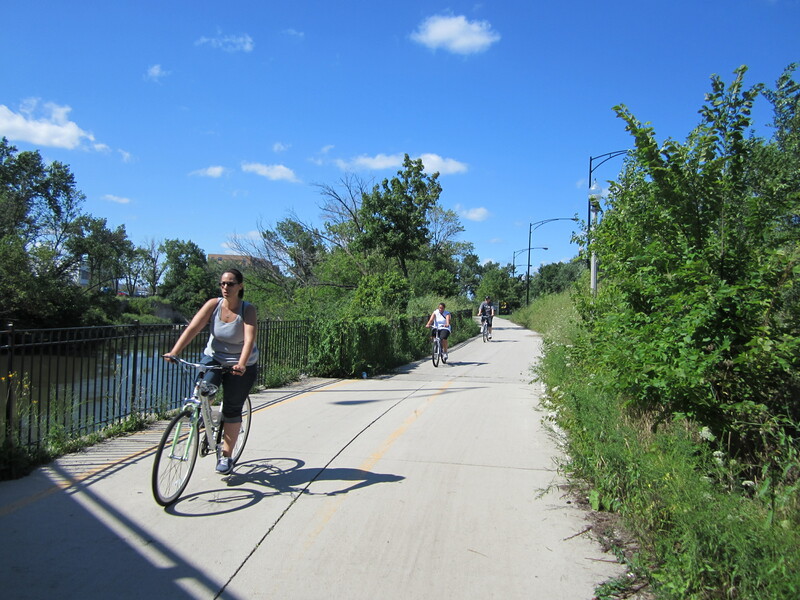 The roughly eighteen-mile route trip from Logan Square was eighty percent off-street paths, which made for a mellow cruise. You can check out a Google map of the route at tinyurl.com/hauling-oats. Departing from the eagle-topped Illinois Centennial Monument, I pedal north on Kedzie then detour onto Albany, a quiet side street that takes me all the way up to Lawrence and the start of the North Shore Channel Trail. For most of the ride out of the city the path hugs the east side of the waterway, with viaducts that allow seamless passage under the major east-west streets. But just north of Lincoln, the trail ends abruptly. The Chicago Department of Transportation (CDOT) planned to build a bike bridge that would safely take riders to the west side of the channel, where the trail resumes. But feisty 50th Ward Alderman Berny Stone vetoed the span under mysterious circumstances. Last year Stone lost reelection to Debra Silverstein, who wants to build the bridge. Once CDOT completes a preliminary design, there will be a public meeting to discuss the proposal, says spokesman Pete Scales. Crossing instead via hectic Lincoln Avenue, I continue north on the trail into Lincolnwood, where the path is lined with wacky public art, like a sculpture that’s a hodgepodge of street signs welded together at odd angles. At Golf Road the path veers northeast, so I take McDaniel Avenue, a tranquil side street, a few miles north to the Green Bay Trail, which runs alongside Metra’s Union Pacific North line—another option for getting to Ravinia sans car. The paved path eventually gives way to a crushed limestone trail through a green tunnel of vegetation, which takes me a few more miles to the venue gates. Hall and Oates put on a stellar show. Although they’re both in their sixties they have energy to burn and look weirdly youthful, probably due to plastic surgery. Daryl Hall’s voice is still strong and supple and John Oates, generally viewed as the group’s also-ran, turns out to be a soulful lead guitar player. Backed by a slick sextet they power through a set packed with hits like “Maneater,” “Rich Girl,” and “Kiss on My List,” encoring with “Private Eyes.” The whole audience joins in on the chorus’ trademark single/double handclaps. The duo has seen a resurgence in recent years partly due to the Internet comedy series “Yacht Rock,” which features hilarious fictionalized accounts of how smooth hits by artists like Hall and Oates, Michael McDonald, Kenny Loggins, Toto and Steely Dan came to be. Portrayed by actors wearing thrift-store wigs, fake mustaches and sailing caps, the musicians are shown hanging out at a boathouse in Marina del Rey, California, speaking in nautical clichés. In keeping with the boating theme, two days later I join my friends Todd, Mark and Hui Hwa aboard their twenty-seven-foot-long sailboat. The vessel, a 1976 Catalina, was originally called “American Express.” But when leftist Chicago Critical Mass cofounders Jim Redd and Michael Burton chipped in on the boat with buddies from the ride in the late nineties they renamed it “American Excess.” If you’re interested in getting a taste of wind-powered sustainable transportation yourself, Chicago Sailing, based in Belmont Harbor, offers lessons, private charter trips and sailboat rentals starting at $55/hour. After I pedal downtown to Monroe Harbor, my pals steer the boat over to the concrete walkway to pick me up. The ramshackle craft has a minor spider infestation, but as we pull away from the marina it’s a gorgeous scene. The sky is cobalt and the lake is turquoise, sparkling with two-to-four-foot swells. 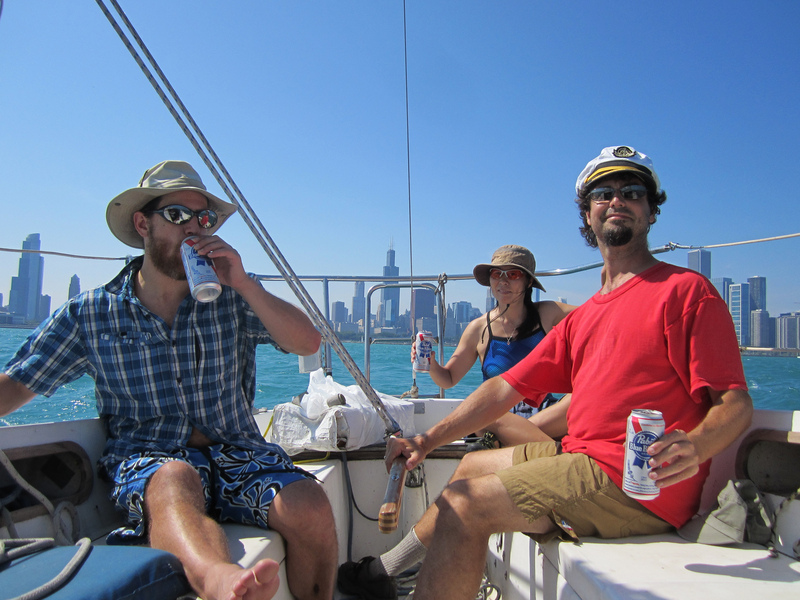 We put the Beach Boys’ “Pet Sounds” on the ship’s radio and my schoolteacher friends, fresh from a rally in Daley Plaza, discuss the impending teachers strike as we sip PBRs and “Wouldn’t It Be Nice” drifts over the waves. 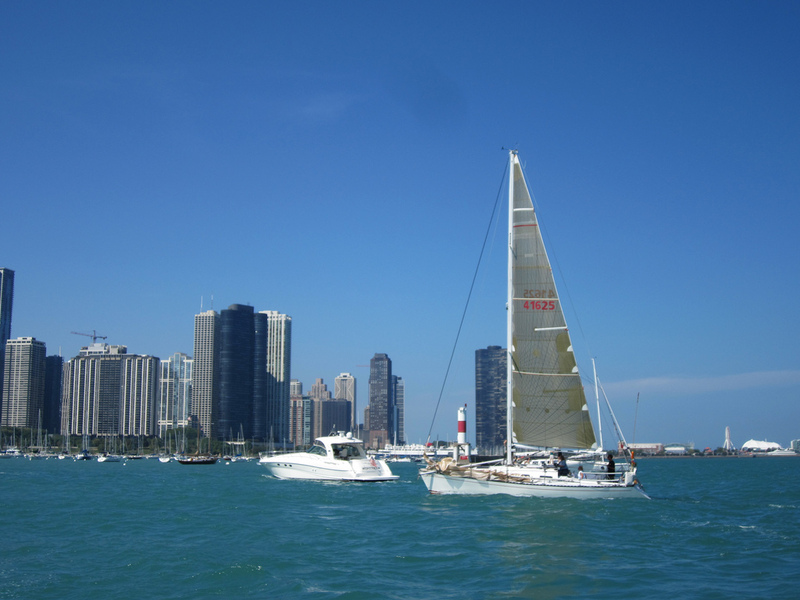 We sail as far south as McCormick Place, and then “tack,” switching the direction of the mainsail, heading east away from the shore until the skyline is tiny and shrouded in mist. I can’t even read on the ‘L’ without getting nauseous, so I took Dramamine an hour earlier, but the pills are several years old and apparently not very effective. Feeling somewhat queasy, I lie on top of the center of the bow to minimize the sensation of motion. With my eyes closed I concentrate on the sound of the waves and the clanking of the rigging. About four miles out we tack again and head north. I rejoin my friends in the stern, have a bite to eat and soon feel shipshape. As we return to shore the skyscrapers get bigger and more distinct, and soon we’re back in safe harbor. Mild seasickness aside, this sailing excursion has been both nautical and nice, further proof there’s no need to jet across the country for a nature adventure. Chicago has a watery wilderness right in its front yard. Ravinia Festival, 418 Sheridan Road, Highland Park, (847)266-5000, ravinia.org. Chicago Sailing, Dock B, Belmont Harbor North, 3550 North Recreation Drive, (773)871-7245, chicagosailing.com. Public meeting: 95th Street station The CTA holds an open house to discuss planned renovations to the southernmost Red Line stop, which will expand the station house, improve pedestrian safety and attract more retail. Thursday, September 13, Palmer Park fieldhouse, 201 East 111th, (800)968-7282, transitchicago.com/95thterminal, 6pm-8pm; free. North Side Critical Mass This more intimate version of the bicycle parade/rally cruises several miles around North Side neighborhoods, typically ending at a tavern. Friday, September 14, Young Lincoln Statue, 5959 North Clark, chicagocriticalmass.org/northside, 7pm; free. Bike the 2nd Ward Join Alderman Bob Fioretti for a tour of the district, including the West Loop, Greektown, University Village, Museum Campus and Northerly Island Park. Saturday, September 15, Fair Oaks Farm, Adams and Morgan streets, (312)263-9273, tinyurl.com/bikethe2nd, 10am-2pm; free. Open Streets Wicker Park/Bucktown Stroll, jog, pedal, play, skate, shop and relax on a car-free Milwaukee Avenue. Activities include Bollywood dancing, a mobile skate park, slacklining and fencing demos. Sunday, September 16, Milwaukee Avenue from Ashland to Western avenues, openstreetschicago.org, 10am-3pm; free.